It’s a nice idea. 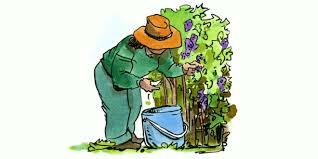 Going out to the garden and just pulling off the vine or out of the ground fresh, healthy, wholesome food. I wish it were that easy! Bugs know how to hide. Those clever little squash bugs, flea beetles and grass hoppers know how to hide and avoid you like the plague. How can it be that a creature smaller than a bread crumb can confound our best efforts to feast on the summer’s produce? And then there are weeds! Even as my first grape vine emerged from near extinction, only a foot or so away another vine emerged looking exactly like my grape. Which one was my grape and which was an impostor? Was it an impostor at all? I honestly could not tell the difference. Sometimes I think bugs and weeds are smarter than we are! Losing weight, finishing school, getting that degree, finding a job, finding reconciliation in a failing marriage, reaching a rebellious son or daughter. It seems life is filled with bugs and weeds that threaten to steal from us our dream of a summer harvest. We can be tempted to just give up and let the bugs and weeds win. 1. There will always be problems, bugs and weeds. 2. Reality is not as easy as it seemed when you were dreaming about it. 3. If you want to eat, prepare for the work to be harder and longer than you thought. 4. A garden requires constant vigilance. You can’t rest until the harvest is in. 5. It’s easier to go to the grocery store but not nearly as satisfying. 6. If gardening were easy, everyone would do it. 7. If you quit, ‘fess up that you never wanted it bad enough to begin with. Admit you didn’t have what it takes and don’t blame the bugs and weeds in your life. Recalculate your goals, aim elsewhere or look within and find something more. Nothing worth having is easy. Choose what you are going to give your life to carefully and then be prepared to spend more than you dreamed and work longer than you thought to reach it. If it is worthy of your best effort and good for you, then God will help you, in the end, to eat the good fruit of a life well lived.